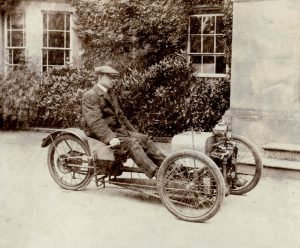 When in 1909, at the age of twenty-eight, Henry Frederick Stanley Morgan (HFS as he came to be known throughout the motoring world) designed and built his first single-seater three-wheeled experimental car, he could never have dreamt that he would become one of the world’s major manufacturers of three-wheeler motor cars. The son of a country clergyman, HFS was lucky not to be forced to enter the church as a profession. Far from discouraging him from making his own way in life, his parents and grandparents gave him every assistance. He was educated at Stone House, Broadstairs, and Marlborough College and then entered Crystal Palace Engineering College in south London, and it was here that his design and artistic talents developed.” In 1906 he opened a garage in Malvern, Worcestershire. “The venture flourished and HFS was then able to turn his thoughts to making a car of his own design. Morgans. 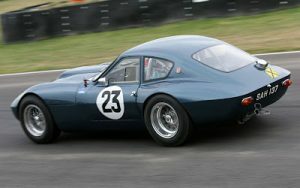 The whole car was very light and was powered by a 7 horsepower Peugeot motorcycle engine. 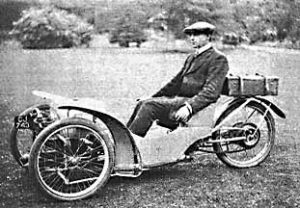 On Boxing Day 1910 HFS entered the first London-Exeter Two Day Trial in the JAP-engined single-seater fitted with tiller steering. He won a gold medal and received favorable press coverage. 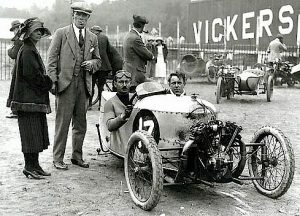 So well did his cars do in competition that at the Motor Cycle Show in November 1911 he was inundated with inquiries and orders. He realized that to maintain momentum he must enter as many sporting events as he could. 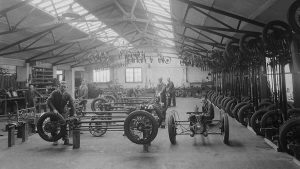 After the war (WWI) public demand for motors far outstripped supply…By 1923 Morgan were being manufactured under license by Darmont in France. 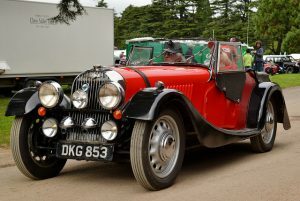 That year Morgan Motor Company introduced the four wheeler called the 4-4, for the four cylinders and four wheel car. The 4-4 model Morgan is still in production. During World War II the company was converted to the war effort and no cars were built. After the war the company slowly began producing cars again. 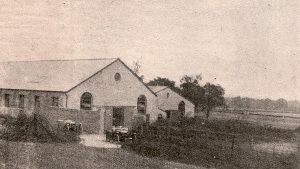 They concentrated on producing cars for export. to England on public roads. far in excess of the 134 mph. Achieved by the Plus Four at Le Mans on the Mulsanne Straight. 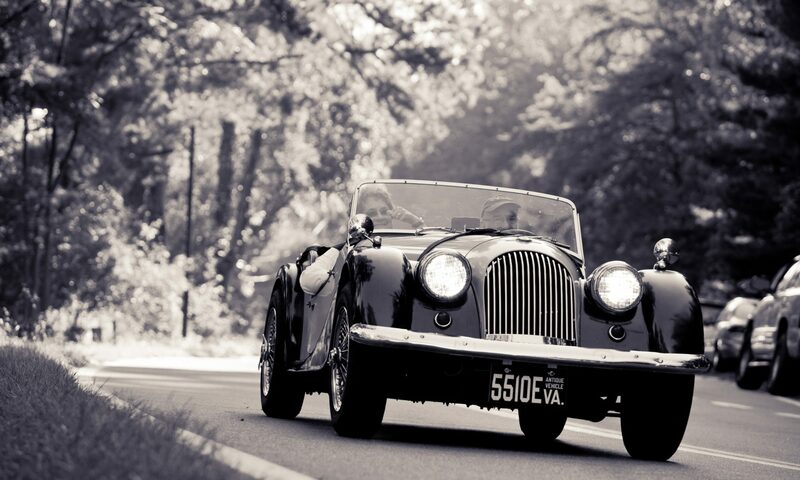 Since that time the evergreen Morgan sports car has gained ground rather than lost it. In an age when nostalgia and the old values of open-air sports car motoring seem so attractive, the flaring-fender traditional Moggie has the extra clout of being the real thing, not just another replicar. But at the time, 1961-1962, things looked black, and Peter had not long been in control. That worst time for the Morgan Motor Co came very early in Peter Morgan’s management of the concern. Born on November 3, 1919, he had grown up with the cars, first 3-wheelers, then four, and after spending the war years in Africa he started work in the factory at Malvern in February 1947. 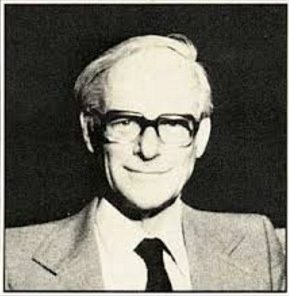 George Goodall retired from running the firm in 1958 and Peter’s father, H.F.S., said, “Come on, let’s see how you do as Managing Director.” The Morgans, father and son, enjoyed an all-too-short year together before H.F.S. died in June 1959. Peter was on his own. His relationship with his father had been very close, more like younger brother than son, he says. “We were tremendously close, we got on marvelously well. I used to co-drive with him on trials and rallies prewar. When I first started here as a draftsman I wanted to design a new body for the car. Working on my own I built a 14-in. model and did drawings of a new 2-seater which I brought into this office to show him, and he said, ‘Yes, that’s all right, but now go away and do the 4-seater.’ Of course, he knew it would be virtually impossible to do a really good-looking modern 4-seater body on the Morgan chassis, and that’s very important to us because remember we were always scratching to sell cars and he figured most people wanted 4-seaters.